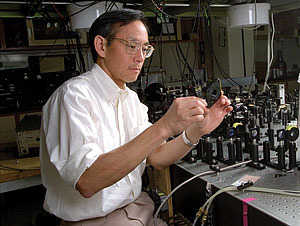 Steven Chu shared the 1997 Nobel Prize in physics with Claude Cohen-Tannoudji of France and U.S. colleague William Phillips for the “development of methods to cool and trap atoms with laser light”: cooling an atom down to a temperature of nearly absolute zero (–273 degrees C.) slows its movement sufficiently that light may be used to trap and manipulate it. The trio’s discoveries, particularly their so-called “optical tweezers” laser trap, have been instrumental in the study of fundamental phenomena and in measuring important physical quantities with unprecedented precision. Chu earned undergraduate degrees in mathematics (A.B., 1970) and physics (B.S., 1970) from the University of Rochester (N.Y.) and his Ph.D. in physics from the University of California at Berkeley (1976). His distinguished career in laboratory science began as a postdoctoral fellow in physics at Cal-Berkeley (1976–1978), followed by an appointment to the technical staff at AT&T Bell Laboratories (1978–1987). As head of the Quantum Electronics Department at Bell, he began his groundbreaking work in cooling and trapping atoms. In 1987 he joined the physics faculty at Stanford University, where he was named the Theodore and Francis Geballe Professor of Physics and Applied Physics (1990) and became active in energy issues, co-chairing an international InterAcademy Council study on “Transitioning to Sustainable Energy.” In 2004 he was named the sixth director of the Lawrence Berkeley National Laboratory. Chu is the author or co-author of more than 160 articles and professional papers, and more than two dozen former members of his research group are now professors at leading research universities around the world.